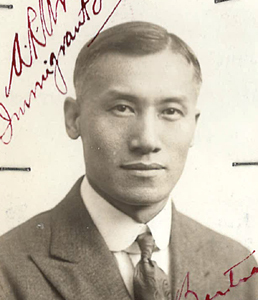 Jock Dock Quong photo, 1929, Chinese Exclusion Act case files, RG 85, National Archives-Seattle, Jock Foo Quong file, Seattle Box 745, Case 7030/10590. Much of the information in this file pertains to Jock Foo Quong’s alleged brother, Jock Dock Quong. He was born on 14 June 1901 in Placerville, Idaho. There was no physician in Placerville at that time of his birth so his grandmother, Leong Shee, assisted at his birth as midwife. 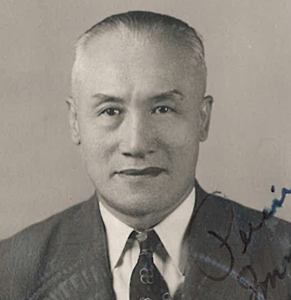 Jock Dock Quong did not have a birth certificate therefore when he wanted to visit to China he needed affidavits attesting to his birth in the United States. 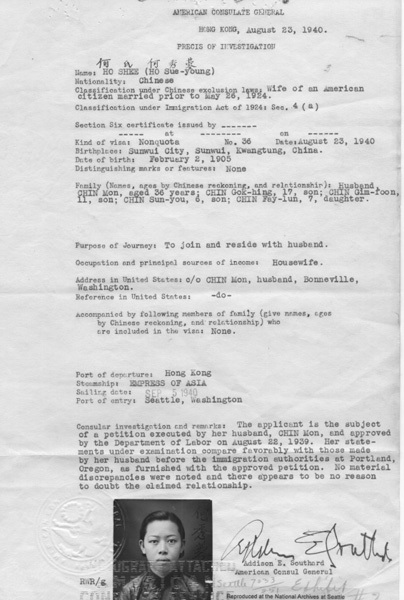 Sworn affidavits were provided by his grandmother, Leong Shee; his father, Jock Yat Kee; and two Caucasians who knew him and his family since he was an infant: John H. Myer and Mrs. N. Hanley. In an affidavit sworn on 4 January 1929, Leong Shee, age 83 years, stated that she emigrated to San Francisco when she was fourteen years old and that she moved to Placerville five or six years later. 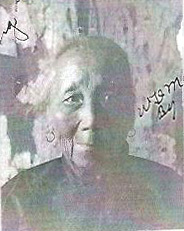 Jock Yat Kee married her daughter Hu Shee and they had seven children, including a son, Jock Dock Quong, born in 1901. Hu Shee died about 1911. Leong Shee took care of her grandchildren after her daughter died. Jock Yat Kee was about 60 years old in 1929. He emigrated to the United States in 1881. 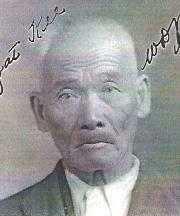 In 1898 he married Hu Shee at Placerville. 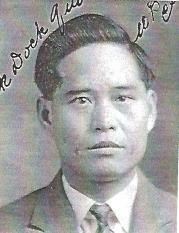 This photo was attached to his 26 January 1929 birth affidavit for his son, Jock Dock Quong. 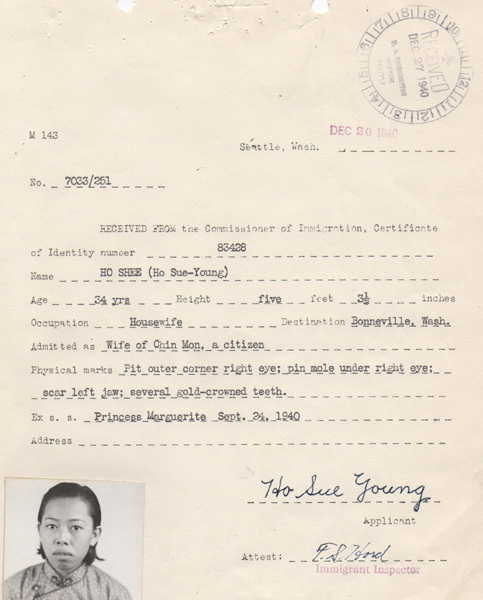 Can Ho Photo, Application for Reentry permit, Form 631, 1930, Chinese Exclusion Act case files, RG 85, National Archives-Seattle, Can Ho (alias Howard Kan), Seattle Box 887, Case 7032/2456. 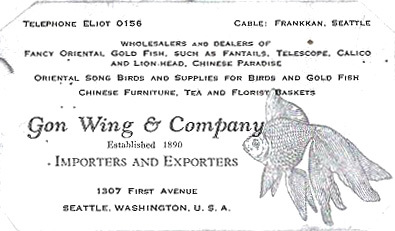 Gon Wing & Company business card, 1930, Chinese Exclusion Act case files, RG 85, National Archives-Seattle, Can Ho (alias Howard Kan), Seattle Box 887, Case 7032/2456. 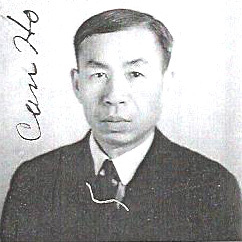 On 6 October 1930 Can Ho (alias Howard Kan), a merchant and member of Gon Wing & Company, 1307 First Avenue, Seattle, WA, filed an applicant for a re-entry permit, form 631. He was 52 years old and was born in Nam Tong Village, China. His parents were Sai Yick Kan and Leong Shee. He was married to Chun Shee who had died recently. 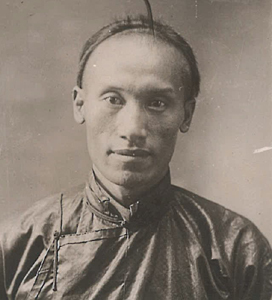 He was originally admitted to the U.S. in 1907 and visited China in 1916, 1927 and 1930. 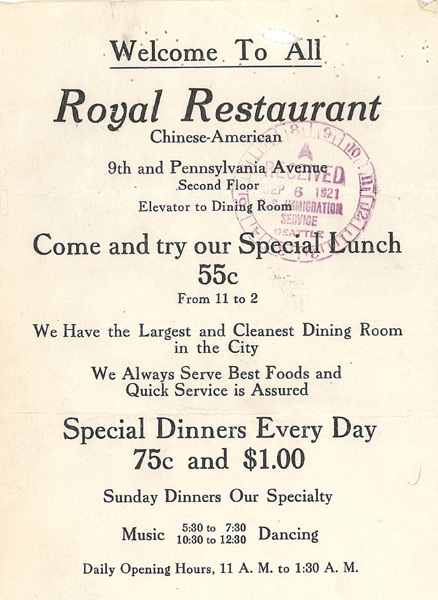 The Immigrant Inspector visited Gon Wing & Company and estimated the merchandise on hand was worth in excess of $3,000. He recommended that Can Ho’s application be approved.